Beginning with version 2.0.100 and above, HoudiniEsq will allow you to select from several templates for billing which include Invoices and Statements. 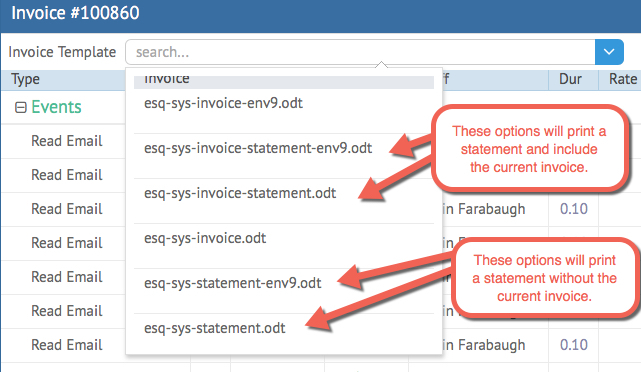 Statements show general information about all billing done across the client whereas Invoice Templates only show items for the current Invoice. 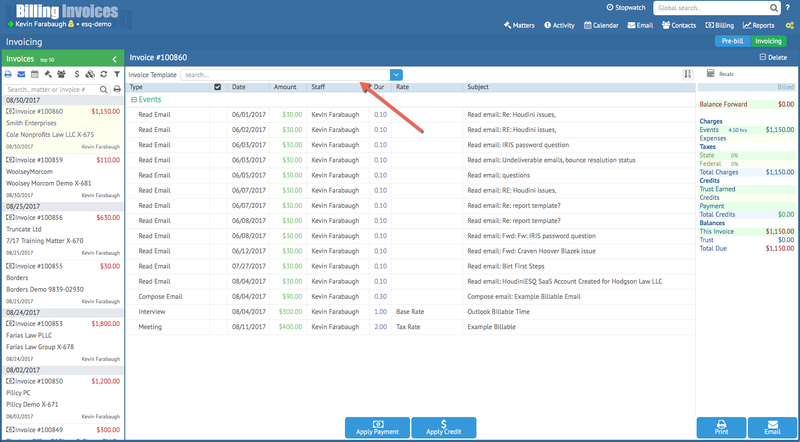 You can find access to both types of billing items in the Invoicing section of the Billing Dashboard. If you are a SaaS user and do not have version 2.0.100 or higher, you will need to clear your browser cache and log back in to access this feature. To select an alternate Invoice template, select the Invoicing tab of the Billing Dashboard. 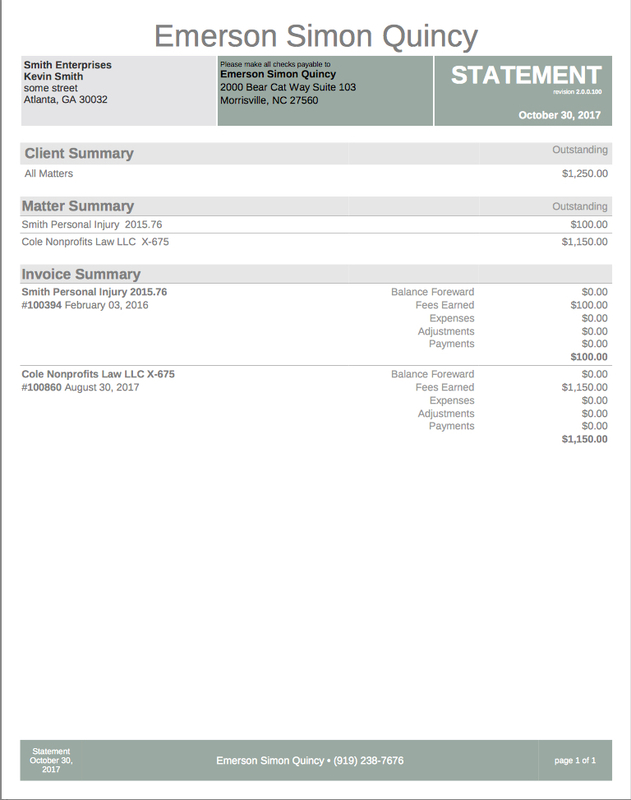 Then, click the Invoice Templates field at the top to select your invoice. See the below image for an example. See below for an explanation of the different types of templates available to you. Any template with “env9” in the name is formatted to fit into an Envelope #9 (front window for recipient). invoice-statement: this template includes both the currently selected Invoice as well as the statement for the client. Below is an example of a Statement without the current Invoice included. Below are a few simple modifications of the HoudiniEsq default invoice, along with the base invoice which is used in HoudiniEsq 2.0. You can modify these templates in any way you see fit, or upload them as type “Invoice” to use, via the Word plugin or in-application template upload. To learn how to upload these templates, click here. Again, ensure the selected upload type is “Invoice”. Note: Invoice and Statement Templates use the same formatting as Document Templates. We recommend you use the templates below as a “base” when making changes, as certain merge fields are specific to these types of templates and may not be available in the Word plugin or the Field References menu. Statement templates MUST have “statement” in the name to pull statement-related data. Invoice Template, no memo, rate or time.